Scandinavia is home to one of the largest youth soccer tournaments in the world. Between the exceptional play, the wonderful hospitality, and the overall culture, our Scandinavian tours have been nothing short of memorable. For over two decades, United Soccer Academy has been leading teams and customizing tours to Scandinavia for individual players, club, high school, and collegiate teams. There are numerous options for teams interested in traveling to Scandinavia ranging from major international youth tournaments, homestay programs, and camps conducted by top European professional clubs and coaches. 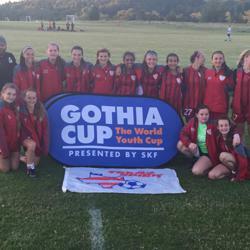 For club and high school teams across the nation, the Gothia Cup has been extremely popular. As the focal point on your Scandinavian tour, players can expect high levels of play and experience soccer in a world-class arena. The Gothia Cup, in its 43rd year, is the world’s largest international tournament with nearly 1,700 teams from 80 different countries. This tournament has hosted players who would grow into some of the best soccer stars, like Xabi Alonso, Ze Adebayor, and Andrea Pirlo to name a few. Interested coaches and team managers may contact United Soccer Academy for a detailed customized tour to Scandinavia.